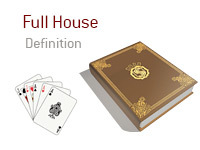 What is the definition of the term "full house" in poker? What does it mean to have a "full house" in poker? A "full house" occurs when your hand makes three of a kind plus two of a kind of any other value. For instance - let's say that you are playing at your favorite online site and you are dealt pocket Nines. Action folds around to you on the button, and you decide to raise. The SB folds, while the BB calls. A full house is a very powerful hand in poker. In the situation noted above, you would be behind to just two hands - pocket Kings and K-9. If the BB has absolutely any other holding, you would be far, far ahead in the hand. Let's take a look at another "full house" example. Action folds around to you on the button. You raise holding J-Q, the SB folds and the BB calls. The flop comes J-J-K. The BB checks. You bet with your Trip Jacks (three of a Kind). The BB calls. The turn brings the 8 of clubs. The BB checks again, you bet and he calls. Even though only one of your cards was used to make your hand, you still made a full house.